At any given point in time, it’s estimated that there are 2.6 million feral goats in Australia, with their populations fluctuating greatly during periods of drought and high fertility, and depending on what management programs are in operation. 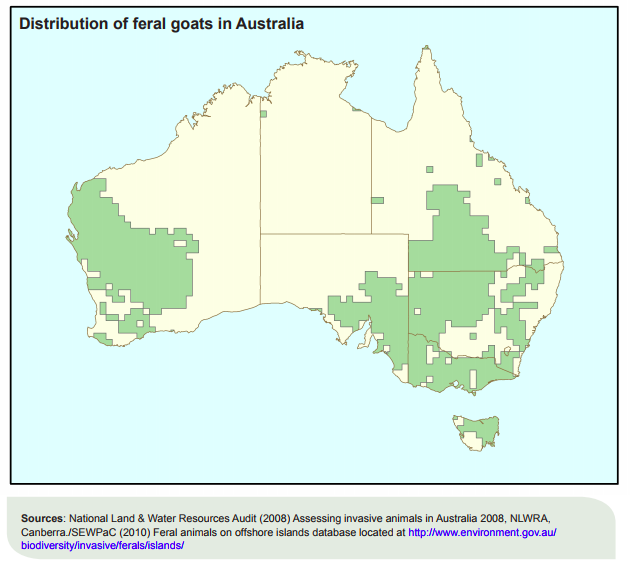 Unlike a lot of other feral animal species, goats aren’t constrained to only certain areas – they cover 28 per cent of the country everywhere from western New South Wales to South Australia, Western Australia and Queensland. However, they do tend to prefer rocky and hilly semi-arid areas. But, where did they come from, and why are they a reason for concern? Goats first arrived in Australia way back in 1788, introduced into the country by the First Fleet. Because goats are small and hardy, can eat a variety of plant-based foods and could provide both meat and milk to settlers, goats were the preferred livestock of early European settlers. Certain breeds were even imported for their lush hair, and later on, to maintain weeds in plantation forests and pastoral land. In fact, they were considered so useful that sailors actually released them onto islands and remote areas of the mainland in the 19th century, so they could be used as emergency food if a situation ever called for it. However, over time, the combination of wild goats and escaped/released/abandoned domestic goats started to present more problems than they did solutions. Population growth started to get out of control, and they started to create problems for the Australian ecosystem. One of the biggest impacts goats have on our natural ecosystem is overgrazing. As their numbers continue to grow, the toll they have on native vegetation such as herbs, grasses and trees starts to lead to erosion, which prevents the vegetation from regrowing in the future. Funnily enough, even though they were once used to prevent weed growth, the seeds they carry in their dung can actually cause the spread of weeds across large sections of land. They also foul waterholes, and during periods of long droughts, compete with native and domestic animals for things like food, water and shelter. One example of this is the yellow-footed wallaby. These wallabies are often exposed to predation by wedge-tailed eagles and foxes because they have to compete for their preferred rock shelters with wild goats. Disease is also prevalent in goats, as they carry footrot and can infect sheep through simple contact. It’s also believed that goats carry a number of exotic diseases, such as foot-and-mouth, and can help disseminate diseases over larger areas if there’s ever an outbreak. This is where things get tricky, as there’s no black and white when it comes to goats. Despite posing environmental and agricultural threats, they also offer commercial benefits and are used for game by recreational hunters. Control can also be difficult since goats have proven almost impossible to eradicate, especially on the mainland, as they bounce back from culling attempts really well. As such, pest controllers usually target areas with threatened native plants, animals and ecological communities. However, there are a few different control methods in place to minimise the impact of goats on Australia’s ecosystem. In areas of arid and semi-arid country, goats can be mustered for slaughter, with female goats often being sold as breeding stock for flocks of mohairs. In areas that are difficult to reach by land, aerial culling has become standard practice. This is usually considered the most humane and efficient method for eliminating small groups of feral goats. Trapping can also be used when water sources are scarce. When it’s hot and dry, water is harder to find and goats need more of it. This means they’re drawn to water sources and are hesitant to move away from them. In these situations, goat-proof fencing with one-way gates can be installed. The goats can get into the fenced off area to access the water, but they will be unable to leave. Finally, radio tracking can also be utilised to track wild goat herds. One goat is caught and fitted with a radio collar before being released into the wild again. The signal in their collar will be tracked until the goat finds a herd that can then be culled. As with all forms of animal pest control, only humane, government-approved methods are utilised. This is a policy that we strongly adhere to here at Animal Pest Management Services. If you have any queries relating to feral goats in Australia, or any other invasive animal species, contact us today!